Swoon!!! I’m over the moon for this one! 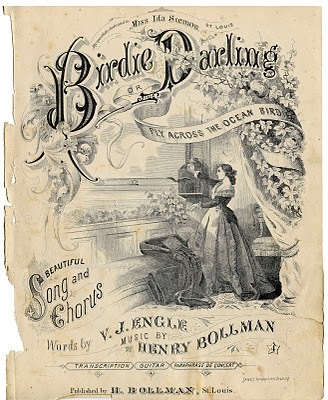 I picked up some fabulous antique sheet music ephemera pieces last weekend, and this one is my favorite! 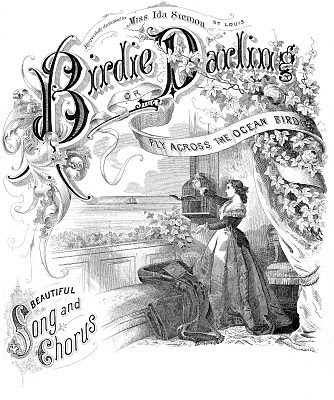 The title of this one is Birdie Darling, and it features a beautiful woman releasing a bird from it’s cage out to the Sea. What a romantic image!!! I adore the original version, torn edges, stains and all, but created a second version all cleaned up for those of you that prefer it that way. These files are quite large so, you may need to click multiple times to get the full size. 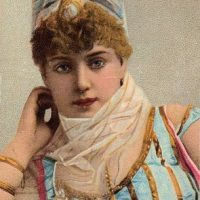 The original is perfection-how do you track this stuff down? thanks! Pretty!! I love the original version! thank you so much! it is beautiful! omg,where do you find all your beautiful images? Thank you so very much!Have a wonderful day. This is beautiful, the detail is amazing don’t you think? Thank you again for sharing with us! On “The Blog Frog”, a blogging comuunity I joined I posted your site as one which “Needs to be Seen” so hopefully you will have more followers! Oh I am loving this one! What do you do with all your beautiful collection? OMGosh, I love this and can’t wait to use on something. Thank you so much for sharing. I agree this is one to swoon over! Thank you so much for everything you do! I love it when you guys get as excited about an image as I do! Oddly enough this one was in an antique booth that I normally avoid at my local antique mall. I usually avoid it because, it never changes, the same stuff has been in it for years, the price tags all faded and a layer of dust all over everything. So boring. Only, last weekend I noticed a couple of new additions so I poked around a bit and found an entire book filled with great sheet music. Very old and beautiful! Wahoo! Thanks for the shout out at Blogfrog. You’re the best!! So, happy you’re joining me up on the moon! Oh my goodness… I LOVE this one!!! I just completed a project using one of your graphics, and started considering taking it apart and using this. Guess I’ll just have to find another project to use it on!!!!! Thanks SO MUCH for sharing with us!!! Wow you did a great job on cleaning up the original. Amazing find. 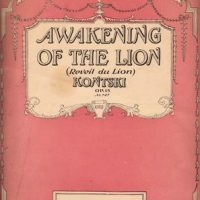 I have some old sheet music I found at my grandma’s estate, that I must upload sometime too. I love it!!!!! The dedication at the top, with the “St. Louis”, fantastic! Ohhh Karen this just the most beautiful sheet music cover ever!!! Thank you so so much for sharing it with us! WOW! These are so beautiful – the green on that mushroom – stunning!!! Oh my gosh it is so pretty! Thank you for sharing. What a wonderful picture!!! Thanks soooo much for sharing!!! Have a nice day! This is a wonderful piece……….thanks so much! Hello!I bumped into your blog recently and i totally fell in LOVE with it!I subscribed immediately. I was wondering, do you have any images related to school or teachers?I am a high school teacher and I want to make a notebook for my collegues this year…Thank you!!! I actually just found some very cute school images last night! I already have my request day images set up and ready to go, but I will post the school ones in the next few days. This is cool. I love this. Thank you!!! My heart nearly stopped seeing this image…..WOW it’s lovely. So very happy you shared it with us…I will have to do something WONDERFUL with this one…as soon as I get my lace together. THANK YOU, THANK YOU, Have a great week. Oh, I think this is my new favorite image from you! Thank you so much. I am so glad you are nutty for old graphics. So are so many of us!! Thank you for going that extra mile for us. thank you so much for the beautiful images! this one is my favorite so far. i just used it to decorate a candle! really added a “wow” factor to my project!